Distinguished medical philosopher, H. Tristram Engelhardt, Jr., Ph.D., M.D., was honored for his contributions to healthcare ethics during the 14th annual Healthcare Ethics and Law Institute (HEAL) conference sponsored by Samford University’s McWhorter School of Pharmacy Friday, April 17. 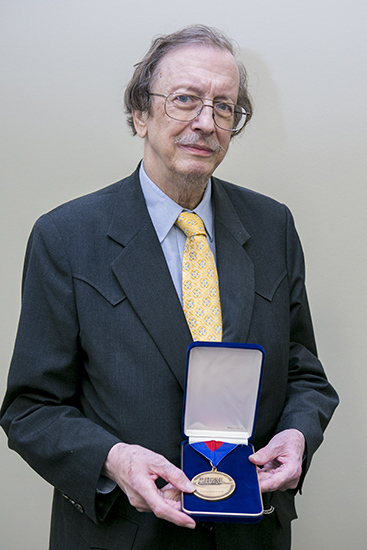 A professor in Rice University’s Department of Philosophy and professor emeritus in the Department of Medicine and Department of Community Medicine in Baylor College of Medicine, Engelhardt was presented the Pellegrino Medal at a special ceremony during the HEAL conference. The medal is named for Edmund D. Pellegrino, the first recipient of a lifetime achievement award from the American Society for Bioethics and Humanities. Dr. Pellegrino often is called the "father of the American bioethics movement." The medal is presented to world renowned clinical ethicists at each HEAL conference. Engelhardt is senior editor of the Journal of Medicine and Philosophy, Christian Bioethics, the Philosophy and Medicine book series with more than 110 volumes in print, and the book series Philosophical Studies in Contemporary Culture. He has authored over 380 articles and chapters of books in addition to more than 125 book reviews and other publications. His work ranges from Continental philosophy and the history of medicine to the philosophy of medicine and bioethics. There have been more than 170 reprintings or translations of his publications. He has coedited more than 30 volumes and has lectured widely throughout the world.